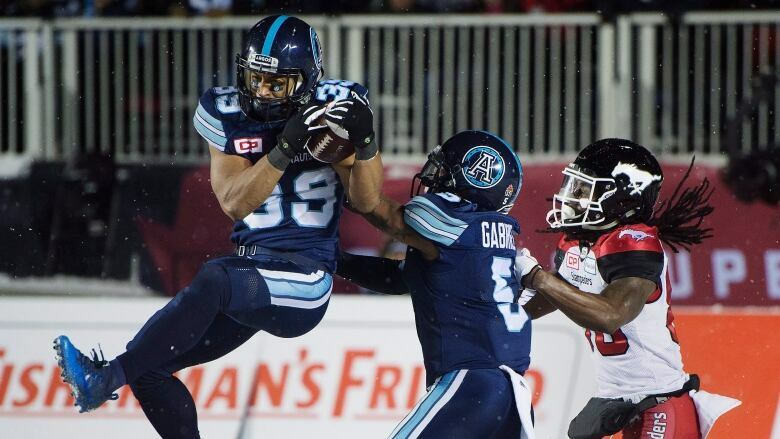 Matt Black's interception in the end zone with eight seconds left in the Grey Cup sealed the Toronto Argonauts' thrilling upset victory over Calgary on Sunday night. It also made good on a promise he made to his daughter, Ava. OTTAWA — There was that electrifying 100-yard touchdown by Toronto's DeVier Posey in the first quarter — the longest passing play in Grey Cup history. And nobody will ever forget that heart-stopping 110-yard fumble return by the Argos' Cassius Vaughn with little more than four minutes left to tie the game. Especially because it looked like Calgary was going to put the Grey Cup game away. But an interception in the end zone with eight seconds left by Matt Black will be etched in the minds of players, coaches and fans alike for a very long time. It was the play that sealed Toronto's thrilling 27-24 upset victory on Sunday night. It was also the play that allowed Black to live up to a promise he made to his five-year-old daughter, Ava, midway though the season. "She said, 'Daddy, bring me the Grey Cup' and I said, 'Ava I'm going to bring it home for you.'" As the snow and confetti streamed down at TD Place Stadium and the Argos were presented the Grey Cup, Black stepped onto the stage with Ava in his arms. When it came time for his turn with the trophy, he didn't hoist it. Instead, he kept Ava in his arms. He kissed her. Then he kissed the Cup. "She's my motivation," Black said, fighting back tears. "And my wife Erin too. They're a big part of the reason why we're champs tonight. I can't put into words what they mean to me. It's why I do what I do and why I fight for everything I get." In August, Black was cut by Toronto. He had been recovering from a groin injury and was set to return when he read a press release saying he'd been released. For six agonizing days, the Toronto-born Black wondered what his football future entailed. He was drafted by the team in 2008 and had played his entire career with the Argos. Then he got his second chance. Argos safety Jermaine Gabriel was injured in Calgary a few days after Black was cut. He was called back into action by Toronto. Black had no hard feelings. The defensive back focused on coming in and being better than ever. "There are so many men on this team who have stories of adversity who overcame stuff. I'm just so humbled and blessed to be a part of this. It means the world to me." Now, he's a hometown hero in Toronto and a household hero to his daughter. As a part of the promise, he also told Ava he'd take the Grey Cup to her school. "And I'll make sure she gets to bring it to her school." As the champagne and beer flew around the locker room and the party hit high gear, one of the greatest Argos of all time, Michael "Pinball" Clemons, tracked down Black. Clemons wanted to let him know how proud he was of him for making the play that sealed the victory. "That might have been the biggest play in Argos history," Clemons said. "I can't even fathom that," responded Black. The two spent a few moments hugging and talking about their families, football and the thrilling Grey Cup win. "I am so proud of you," Clemons told Black. "Your patience and diligence has paid off." Black was still trying to wrap his mind around what one of his football idols had just told him as he soaked up the moment. "I am just so happy for the men in this room. I just look around and see us all celebrating. "This is what it's all about. Doing something nobody thought you could do in February, when we had no GM and coach [and] not a single person associated with the CFL said the Toronto Argonauts were going to be Grey Cup champs," Black said. This is the second Grey Cup win for Black. He won his first with the Argos in 2012. But this was different for him. "Every thing this team has overcome, all the ups and downs, we always had belief," he said. "We went into the season with that fire burning inside of us and we finished it off tonight." Ricky Ray is the first quarterback in CFL history to win four Grey Cups as a starter. "In a league like this, with so many great quarterbacks, to be able to say I did that is an unbelievable feeling. But it's not all about me. I'll enjoy it but being here with these guys is something special." With less than three minutes left and the game tied, Ray stepped onto the field looking to lead his team to victory like he has so many times. Ray was brilliant under pressure, just like he was a week earlier when he led the Argos to victory over Saskatchewan. He marched Toronto down the field, setting up the winning field goal. "I just told myself to go out there and execute," he said. "It was no different this week. That's what we did." It was the 43rd game-winning drive of his career. "This is why you play the game, for an opportunity to win a championship. It was too good of a season, too special of a group to not have this ending and we found a way to do it," Ray said. Leading into the season Ray wasn't even sure if he'd be the starting quarterback for Toronto, but that all changed when coach Marc Trestman took over. He made it very clear Ray would start. "Coach Trestman just showed us the way, he showed us the plan to get here and we were just trying to do it one week at a time," Ray said. They orchestrated back-to-back championships in Montreal together, and now Trestman and Toronto general manager Jim Popp are champions together again. The two took over at the end of February after an off-season of question marks in Toronto. They had very little time to piece together a team that just a year earlier had finished in last place with a 5-13 record. The two got to work and manufactured a rapid turnaround. "It took everybody," Trestman said. "We did it together and put it together brick by brick. We had a vision, we had a plan to do it and we did it one day at a time." Popp brought his family onto the stage to celebrate the Grey Cup win. It was his 11th trip to the championship and the fifth time he's won it. "It never gets old," he said. "I've been very fortunate to be in these games. My great enjoyment is being in this moment with families." As for what's next for the general manager and coach? "I'm going to have a good time tonight," Popp said. "We're going to get to Toronto and have parties for two weeks." The Grey Cup celebration for the Argos is set for Tuesday in Toronto at Nathan Phillips Square, starting at 12:30pm.